Kelly and I arrived early Sunday morning on the same set of flights from San Francisco to Auckland to Wellington. That strange time traveling thing where you leave one day, travel about 13 hours, then arrive two days later, completely skipping the day in between. At least you get a day back when returning home. Tuesday, I had the good fortune of leading a full-day workshop on design and CSS. I had a good crowd for the workshop, filled with folks of varying skill levels and team roles. It was a fun day, even though my voice had vanished by the end of the day. We covered everything from beauty to layout to advanced techniques to style sheet organization and troubleshooting. If you were there, thank you for attending — I hope you gained a higher level of understanding and inspiration as a result. The conference kicked off yesterday with a brief video from Tim Berners Lee. After TBL, I took the stage and delivered the first presentation of the conference — heh, no pressure there! I introduced the brand new, yet very simple concept of Common Structure, which I’ll write about later in the next day or so. (I’ll also be posting my full set of slides.) Definitely more to discuss there. Incidentally, if you’re ever speaking at a conference, don’t let them put Joel Spolsky immediately after you. While I can’t really tell you what the subject of Joel’s talk was, it was funny, well-delivered, and had the crowd laughing in fits every 30 seconds. In the past few years, I’ve attended quite a few conferences, both as attendee and as speaker. After attending Web Essentials in Sydney for two years, and @media in London last year, I thought I had experienced the high points of medium-scale web conferences. Now that Webstock is here, it appears the bar has been raised significantly higher. Maybe it’s the diverse set of speakers that are here. Or the well-prepared team of organizers and volunteers that have been so hospitable and accommodating. 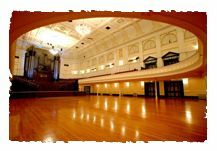 Maybe it’s the gorgeous venue of Wellington Town Hall. Or maybe it’s the massive stage and fluid multi-media team running everything behind the scenes. Or the well-designed branding that permeates the entire experience here. Or it could be the sponsor booths just outside the main auditorium that actually seem interesting, relevant, and entirely appropriate. (Props to Microsoft/Auckland for having a friendly, engaging team manning their booth.) Or perhaps it just comes down to the people attending the conference–especially all the Kiwis–and their enthusiasm and excitement that a conference on this grand of scale and importance is happening right in their own home city and/or country. Last night, the organizers arranged a wonderful and uniquely New Zealand dinner experience at the very tiny and intimate Kai in the City. Truly enjoyable and entertaining, it was a special experience that connected us with Maori culture, songs, and food. A truly impressive conference. I’m honored to have been invited and to be a part of it. It’s also cool to meet so many amazing and gracious people as part of the ride. Just a half day left, and it will all be over. I’m participating on a panel discussion this afternoon with Joel, Kelly, Steve Champeon, and Russel Brown, so there’s just one more speaking commitment, then we’re done. If you’re here at Webstock, see you tonight at the dinner and closing party. If you’re not here, make plans to be in N-Zed next year this time.